Tingling extremities and numbness are sensations that are typically felt in the hands, arms, fingers, and feet. This is the feeling that many people describe as their extremities “falling asleep”. Common symptoms of tingling extremities and numbness include pins and needles and a "burning sensation". Tingling extremities and numbness are often experienced together and are usually only temporary. However, they can indicate serious medical conditions if experienced in combination with other symptoms, like slurred speech. Hormone fluctuations. Estrogen affects the central nervous system, so when hormones shift during menstruation, pregnancy, or menopause, women tend to experience tingling extremities more often. Lack of movement. 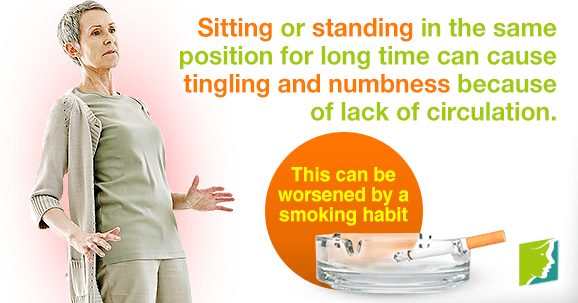 Sitting or standing in the same position for a long time can cause tingling and numbness because of a lack of circulation. Lack of vitamins. Abnormal levels of vitamin B12, calcium, potassium, or sodium has been known to cause tingling and numbness. Vitamins E, B1, B6, B12, and B3 are essential for healthy nerve function, so B12 deficiency, for example, can lead to pernicious anemia, a central trigger for peripheral neuropathy. In addition, too much B6 also can cause tingling in the hands and feet. Allergies. Allergic reactions - especially from seafood - can cause tingling and numbness, as well as swelling and other symptoms. Pinched nerve. Sometimes, a certain posture or body position can pinch a nerve and result in tingling feelings. Nerve injury. Injuries to the neck and lower back can cause tingling extremities and numbness because they can affect the nerves. Other syndromes like nerve entrapment can cause tingling in hands and feet. Stroke. Some of the common symptoms of a stroke include slurred speech, tingling extremities, and numbness. Maintaining a balanced diet and staying hydrated is vital to feeling your best and preventing these symptoms. Also, taking vitamin supplements can help correct vitamin deficiencies and reduce tingling and numbness. Getting regular exercise (i,e.,at least 30 minutes of aerobic activity daily) is recommended to reduce stress, improve circulation, and boost energy. Yoga, swimming, and walking are all excellent low-impact exercises. If you experience tingling extremities and numbness in combination with slurred speech, blurred vision, or loss of bladder control, it is best to talk to a physician. This could indicate a more serious health condition. Tingling sensations are typically caused by pressure on a nerve or artery, causing lack of blood flow to the extremities. Hormone fluctuations during menstruation, pregnancy, and menopause can also cause tingling extremities and numbness. However, maintaining a healthy and active lifestyle can help prevent the occurrence of tingling extremities and numbness. Many women experience numbness and tingling extremities during menopause. Keep reading for more information on how to handle the symptom. Foot tingling can occur at any stage of life. However, it becomes particularly prevalent during times of hormonal imbalance, such as during menopause.